These Marfy 0885 culottes evoke a style popular in the late ’60s and early ’70s. These culottes evoke a style made popular in the late 1960s and early ’70s. 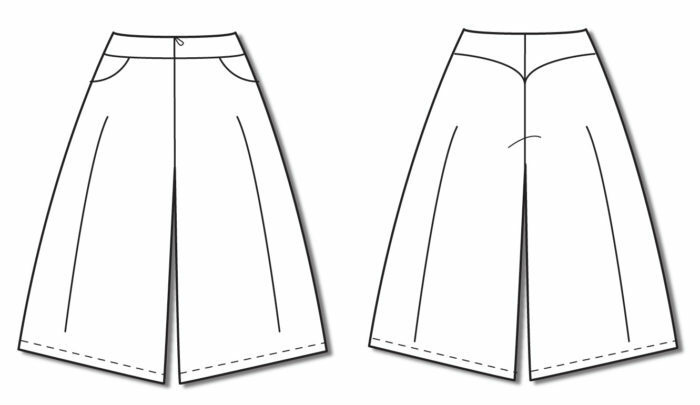 They are wide-legged, knee-length, and have a contoured yoke where the top edge sits at the natural waist, a center-front zipper closure, and side-front pockets. Our tester found 1 inch wearing ease at the waist; adjust it for a looser fit if desired. The zipper type is unspecified in the pattern, but our seamstress chose an invisible zipper. Other opening options include an invisible zipper at the side seam or center back. Marfy patterns come without sewing instructions and have no seam or hem allowances. Match points are marked with letters, and all matching seams are the same length. Unlike Marfy’s paper patterns, which are hand-cut to a specific size, this PDF includes all sizes. Apply wider seam allowances for more leeway in fitting. Fabric choice will make this look work for any season. Use stable but drapey fabrics such as a lightweight knit, double georgette, silk noil, or a medium-weight rayon. Sewing tip: Add an interior tab closure to reduce the stress at the zipper’s top edge.